United States, 1955-1957 This handsome set is part of the Taliesin collection that Frank Lloyd Wright designed for Henredon in 1955. It comprises a coffee table whose hexagonal top sits on a tripod base and two triangular stools that fit underneath. USA, 1960s Known for her playful and often extravagant designs, Phyllis Morris created this Hollywood Regency–style coffee table with four outsized silver tassels forming the support for a large glass top. Italy, 20th century This coffee table was designed by Paolo Piva in 1982 and manufactured by B&B Italia. It features a geometric and sculptural steel base and a large, square glass top. USA, 1950s This Art Deco coffee table features a glass top above a mirror in the same unique shape. The legs are constructed of black wood stacked with glass and brass accents. USA, 1970s Vladimir Kagan’s iconic Snail Table, designed in the 1960s, features a spiral walnut veneer base and a curved rectangular glass top. The top is the original greenish glass. The measurements above reflect the coffee table with its top. 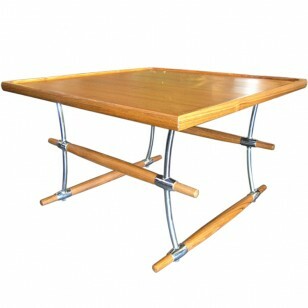 USA, 1950s Unique three-legged coffee table with glass racetrack top and brass-capped legs. Denmark, 1960s This large coffee table by Willy Beck is beautifully inlaid with handmade tiles by Danish ceramicist Tue Poulsen. One tile is signed “tue” by the artist. United States, 1950s Harvey Probber designed this striking octagonal coffee table in the mid-1950s. The walnut frame features a criss-cross base. Set into its top, eight travertine triangles create a swirling geometric effect. 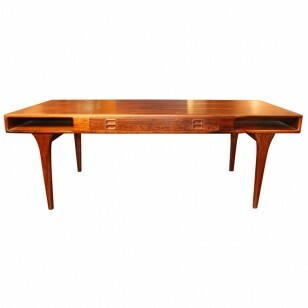 Italy, 1953-1954 Beautiful and rare Gio Ponti coffee table. Impressed to underside: [Made in Italy]. Unknown, 20th Century This low table is in the form of a scroll and features beautiful, hand-painted, golden designs of a lotus and bird motif. 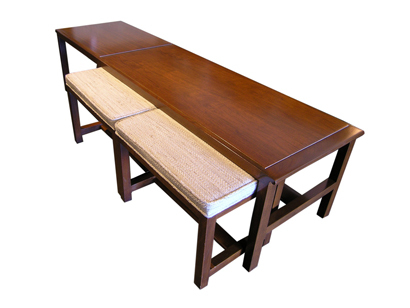 USA, 1970s This Parsons-style coffee table was made in the 1970s by a Boston, Massachusetts, custom furniture company. The beautiful walnut burlwood enhances its clean lines. 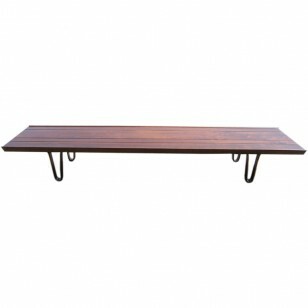 Denmark, 1950s Unique sculptural teak coffee table by Johannes Andersen for CFC Silkeborg. 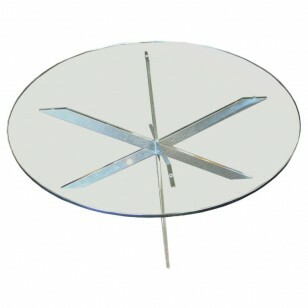 USA, 1970s This Pace coffee table is composed of a round glass top that sits atop four solid lucite legs. The glass in 36″ in diameter and 3/4″ thick. The lucite legs each have a diameter of 3″. USA, 1970s This large and unique coffee table is covered in patchwork copper that showcases the beauty of the material and the range of brilliant colors it can assume. USA, 1983 This unique coffee table is comprised of three individual base sculptures which can be arranged in any configuration. As much a piece of art as it is functional, this table will make a statement in any setting. 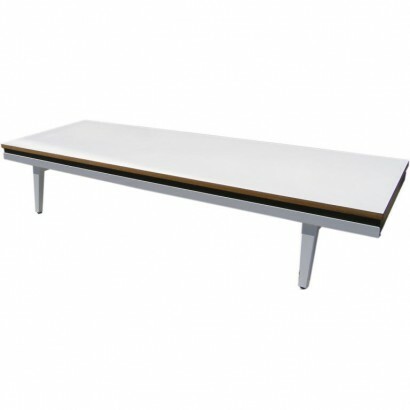 USA, 1970′s This beautiful free form table is solidly built and has a wonderful presence. USA, designed 1966 This size coffee table is no longer in production. The 1966 collection was designed at the request of Florence Knoll, who wanted well-designed outdoor furnishings that would withstand the corrosive salt air at her home in Florida. 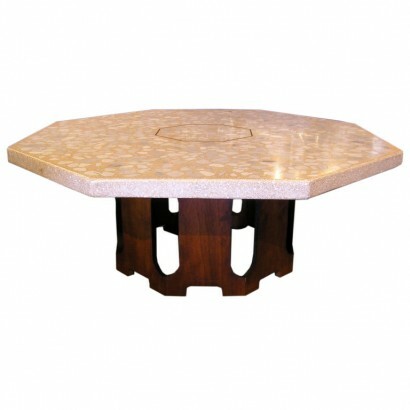 USA, 1960s Large round polished slate table top on an octagonal walnut base. 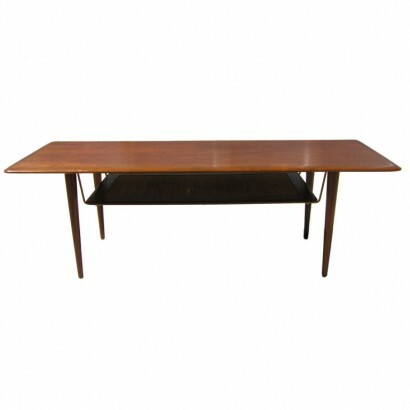 Denmark, 1950s Extra long coffee table by Dux has an ebonized top. 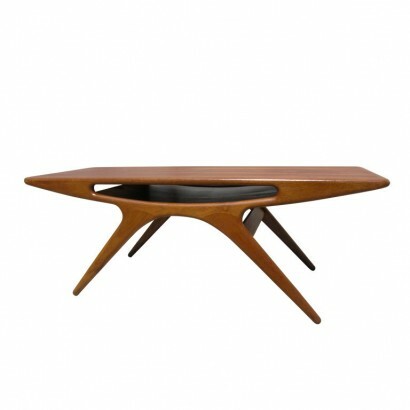 USA, 1970′s This unique coffee table features a sculptural flowering tree base with a rounded-edge glass top. 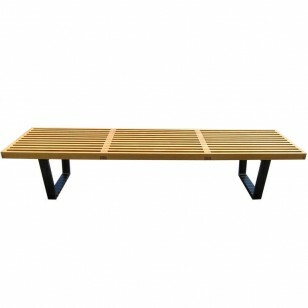 The base measures 36″L x 20″D x 16″H. Italy, 1970′s This striking large, low coffee table features a unique half-cylinder base construction. The base is permanently fixed to the table top with invisible adhesive. 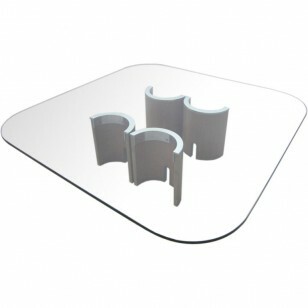 Italy, 1960′s This coffee table features an angled sculptural chrome base with a 1/2″ thick glass top.